Research suggests that the opportunity for learning and development is one of the top five considerations when searching for a new employer. ECU’s value of Personal Excellence supports a culture of continual learning. Throughout your career journey you will be able to participate in personal, professional and career development opportunities. Whether you are an academic or professional staff member, your line manager can help you to map a development plan relevant to your needs throughout each stage of your career. Figure 1 sets out the ECU career journey. Browse through this website to see learning and development opportunities which may be relevant at each stage of your employment. The RBDF outlines six strategic capabilities and six main roles types at ECU. Mapped to these role types are both required and optional professional development modules that enable, enhance or improve individual performance. There may be other courses required in your role which are not recorded on the RBDF. You will be advised of these by the relevant manager. The RBDF Web-Based Tool, is used to plan your development needs throughout your ECU career. Staff can edit a free text box to add any development opportunities not included in the RBDF. Once staff have selected their development, line managers will approve the selection. This forms an Agreement which becomes part of the annual Management for Performance System (MPS). You can access the RBDF Web-based tool from the Staff Portal Easy Logins. Once your plan has been approved you can then enrol in any of the ECU scheduled courses by using the Staff Development Portal. This is a website within the Learning Intranet which lists all available internal scheduled workshops. By clicking on the title you will open a window with a description of the course. You can also see all the scheduled dates and locations available. By clicking on the “nominate” link you will be seamlessly directed to the Staff Kiosk where after login will automatically take you to the correct page to enrol. There are various ways to browse the Staff Development Portal which will be shown on the left hand side of the home page. As part of your contract and welcome email you will receive some policy documents which will outline some of the requirements and expectations of your employment. You will also receive some links to various induction courses which can be completed when you commence in your role, as well as some other interesting information to begin your orientation into the organisation. Your line manager will guide you through various activities to develop your understanding of your local work area and ECU Operations. Getting started – help to get you settled in to your new environment, including parking, Staff ID and access cards, access to Staff Portal and Staff directory. Required items – This is the formal part of the online induction where you need to work through various items as part of your employment. (Links to Inductions below). Life at ECU – This helps you to explore what else ECU has to offer with regards to facilities and activities for you to get involved in. Required Inductions – As mentioned in your welcome email you will have been automatically enrolled into several inductions required by legislation. These and other inductions are listed below. You will be notified as to which inductions you are required to undertake either via your contract or your line manager. Face to Face workshop and networking lunch. All new ongoing and fixed term (more than six months) staff are required to attend. An insight into the University’s strategic priorities, key functions, life and culture at ECU. Networking opportunities with Senior Executive staff and other new appointees. 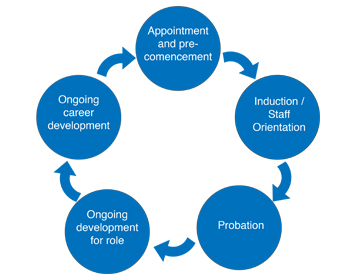 Probation involves setting work objectives, identifying professional and academic development opportunities and confirming training requirements required for your role. Professional and academic development workshops within the following categories, offered in a variety of face-to-face and blended models. The Staff Development Portal allows you to view all professional and academic development courses available for enrolment. Some roles in the University require further regulatory and or legislative training to be allowed to undertake the work required. You will be advised of this by your line manager or other relevant party. Management and leadership just-in-time resources (provide link when available) – This is a compilation of articles, web links, Lynda Campus courses and face-to-face workshops to guide you in building your skills within a flexible framework. The Centre for Learning and Teaching offers a PDC program that provides essential professional development for academic staff across a range of different academic staff roles. The courses run throughout the year in line with semester times. Teaching academics are able to enrol in these courses via the Staff Development Portal (as above). Ongoing development is available throughout your employment. This is discussed and agreed as part of the Management for Performance System. You will continue to use the RBDF Web-based tool to plan your development either to select existing ECU workshops or by the use of the free text box. MPS is the system in which staff and managers work together through an annual cycle to plan and review individual performance and identify opportunities for career development and training. As your role develops and you set your work objectives for the year you may require additional or continued capability development. Building on the previous sources of development in the above sections, you may also take advantage of some other internal and external avenues as agreed by your line manager. The Centre for Learning and Teaching (CLT) offers a peer review of teaching programmes that fosters professional learning, teaching observations and discussions of teaching practices. CLT offers a variety of workshops and individual support aligned to the ASPEO framework and good teaching practices. For more information see the Learning Intranet. Change (link to change website) is a constant within the global business community and ECU is no exception. Investing in personal development will help you adapt to future changes and pursue new career opportunities. To ensure your skills and capabilities remain relevant and you enjoy personal growth and a fulfilling career there are many opportunities for you to continue your development. Development and training in volunteer roles including Fire Warden, First Aid Officer, Occupational Health and Safety Officer. JLP Mentoring Program – The Joondalup Learning Precinct (JLP) includes ECU, WA Police Academy, NM TAFE and Joondalup Council. Staff can participate in a mentoring program where they will be matched with someone from one of these organisations to work on individual capability needs. The ASPIRE Program – An initiative of the Perth Convention Bureau, ASPIRE awards are granted to individuals to assist in their personal and professional development, either through attendance at a relevant international conference, or by undertaking further study in their chosen field of endeavour. Professional Development Fund – Professional Staff and Academic Career Development Fellows may be eligible to apply for funding for career development options.